Home » Holiday » GO NUTS FOR PURIM! 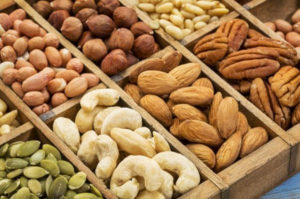 I say NUTS to the pre made and packaged stuff for Shalot Manos baskets and run to the grocery and grab gobs and lots of pecan, walnuts, cashews, macadamia, pistachios and almonds to concoct sweet and spicy treasures to share with my friends. I buy in bulk and it keeps the cost way down. I make up huge batches, use self sealing plastic bags and then divide them among the baskets. The following recipes can all be made a week or two ahead of when you need to deliver the baskets. All are simple to make, delicious to eat and are guaranteed to make your basket the one everyone remembers. For the most part, you can substitute margarine for butter to keep things pareve but it does alter the consistency and taste slightly. Preheat oven to 275. Have an ungreased 15-1/2 x 10-1/2 inch jelly roll pan ready. Using an electric mixer, place egg whites into a large bowl big enough to accommodate the nuts. Beat until the whites form soft peaks when beaters are lifted. Add brown sugar, 1/4 cup at a time, beating well after each addition until mixture is stiff and glossy. With a large spatula, stir in melted butter. Gently fold nuts into meringue mixture until they are evenly coated, taking care not to break nuts. Spread coated nuts evenly on ungreased jelly roll pan. Bake about 1 hour, stirring every 15 minutes to keep nuts separate, until meringue is dry and nuts are crunchy. Let cool in pan, stirring occasionally to keep separate. Spread shelled nuts (except macadamias) in a single layer on a baking pan. Bake in a 350, stirring often, until golden. Allow 5 to 7 minutes for pine nuts; 8 to 10 minutes for pecans, pistachios, and walnuts; about 15 minutes for almonds and hazelnuts. Macadamias need lower heat because they scorch very easily; roast them at 300 for about 20 minutes. Watch nuts carefully since they brown quickly. For more toasted flavor, bake nuts to a darker color. Remove and discard chili stems. Whirl the chilies, with seeds, in a blender or food processor until finely ground. In a bowl, mix ground chilies, honey, sugar, oil, salt and cayenne. Add nuts and stir until coated with seasonings. Pour nuts onto oiled 15 x 10-inch pan; shake into 1 layer. Bake in 300 oven, stirring often, until golden brown (under skins, if not blanched) and honey mixture hardens, 25 to 30 minutes. If necessary, push nuts apart; cool in pan. Serve, or store up to 3 days. Makes 3 cups. In a small bowl combine sugar, salt and black and red peppers. Heat a large skillet over medium-high heat; add pecans; cook and stir until hot, about 1 minute. Reduce heat to medium; sprinkle pecans with half of the reserved sugar and pepper mixture; cook and stir until sugar melts, about 30 seconds. Add remaining sugar and pepper mixture; cook and stir until sugar melts and coats nuts, about 40 seconds. Place nuts on baking sheet; cool slightly and separate. Store in a tightly covered container. Makes about 1 heaping cup. Place pecans in crock pot. In a bowl combine the melted margarine or butter, soy sauce, five-spice powder, garlic powder, ginger and red pepper. Pour over nuts. Stir to coat nuts. Cover; cook on low setting for 2 hours. Uncover and stir. Turn to high-heat setting. Cover and continue cooking on high for 15 to 30 minutes. Cool. Makes 4 cups. Mix the almond paste, coffee liqueur and coffee powder until smooth. Spread 1/2 tsp of the mixture on the flat side of a walnut half and top with another walnut half, forming a sandwich. Repeat with the remaining almond paste and walnuts. Line a large baking sheet with wax paper. Dip one end of the walnut in the melted chocolate and set on the baking sheet. Repeats with the remaining filled walnuts and chocolate. Refrigerate until the chocolate is set, about 30 minutes. Cover with plastic wrap and store in refrigeration. Makes 36.